Finish: Red Oxide Primer & Pre-coated galvanized. Usages: Secondary member to support roof panels. Designed to meet specific load criteria. EZ purlin ?” variance in flange width & 50 degree angled stiffener lip. 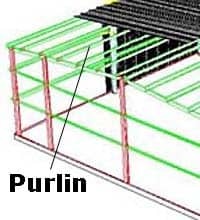 Allows easy placement of purlins and easy installation and greater stability. 50+ combinations of size, gauge, spacing and lap length. Optimum design and economical pricing. Continuous purlin lap lengths of 1′ 2 ?”, 2′ 5 ?”, 3′ 8 ?” Optimum design and economical pricing. Pre-painted, factory baked red oxide finish. Smooth, attractive appearance, improved adherence & durability. Therefore, no paint sticking problems. Purlin clips welded to frame. 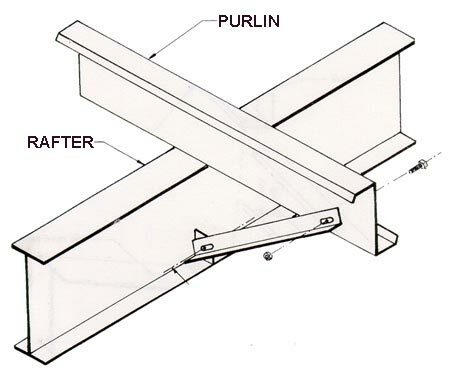 Rest point during erection, quicker erection, reduces purlin roll under heavy loading, & increases stiffness. Optional Galvanized finish. Meets specifications, greater resistance to some corrosive atmospheres. Tabbed sag angles are used with standing seam options/systems. Reduces purlin roll, increases stiffness, ease of erection, greater stability, and increased load capacity. With a wider width and higher gauge zee-purlin, we can go to a longer bays up to 40′. Longer bay buildings, can be furnished with the advantages of a cold-formed zee-purlin.